A Thing or Two About SUPER STEAK. I was looking at some old photos collection on my hard-drive and realized that I need to post about this favorite steak place of mine. It’s not a fancy steak restaurant, you can dress up as casual as you want and just bring your appetite, and they will take care of your meat craving. Meet SUPER STEAK. They have two branches right now, with the main outlet located in Jl. Dempo, Kebayoran and has this homey & laid-back ambience, because this gem is literally hidden inside a housing complex with security-guarded portal. The other branch is much easier to find, in Urban Kitchen Senayan City (although there is some slight price difference). I have tried both outlets, and I’d have to say that the main branch in Jl. Dempo gives a more personal experience. Let me first warn you that with quality comes quite a hefty price tag. 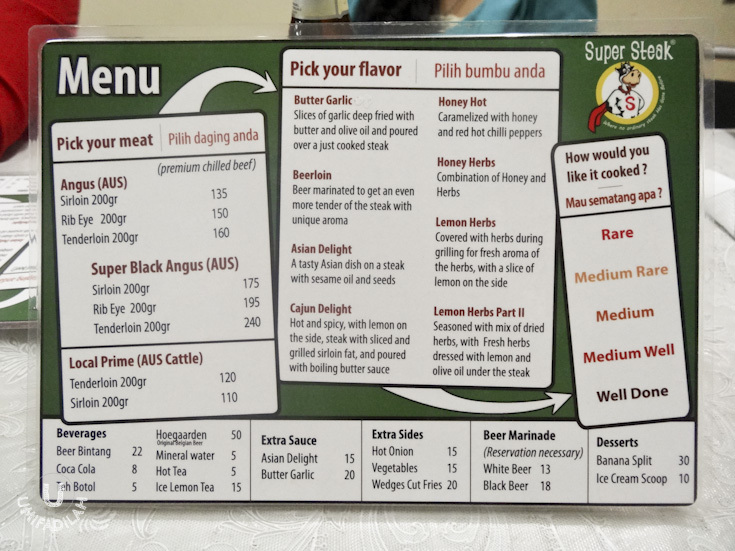 You get what you paid for, and SUPER STEAK is definitely not cheap. That’s why I suggest you to come here on several designated occasion and when you do, go all-out on your spending and choose the best cut that suits your liking. I always think of visiting SUPER STEAK only when I feel like I deserve a self-reward, lol. This is said to be their best seller flavor, and if you like your steak to be a bit garlicky and has that elevated zing that gives more kick in term of crunch & saltiness, then this might be the perfect choice for you. We ordered the regular Angus but when I took my first bite I was like, “Did we ordered regular Angus or Super Black Angus?” It’s so tender it almost melts in your mouth, no extra chewing effort required. This particular flavor has one of the most mouthwatering description that I just couldn’t resist not trying. And rib-eye might just be the perfect cut for it! For me it’s better than the Butter Garlic, in a way that all of the flavors are bursting out with the right level of heat and acidity. Tasty! Another Lemon Herbs Part II, different cut. Now this is my best pick of all flavor that I’ve tasted. For some reason, the plating is also different from the rest, where they serve it on top of a wooden chopping board instead of a plate. I’m guessing that it has something to do with them having to create a ‘bed of olive oil & herbs’ to rub the cooked steak on top of it. The flavors are actually not as complex as the Cajun Delight, but I actually liked this one better. 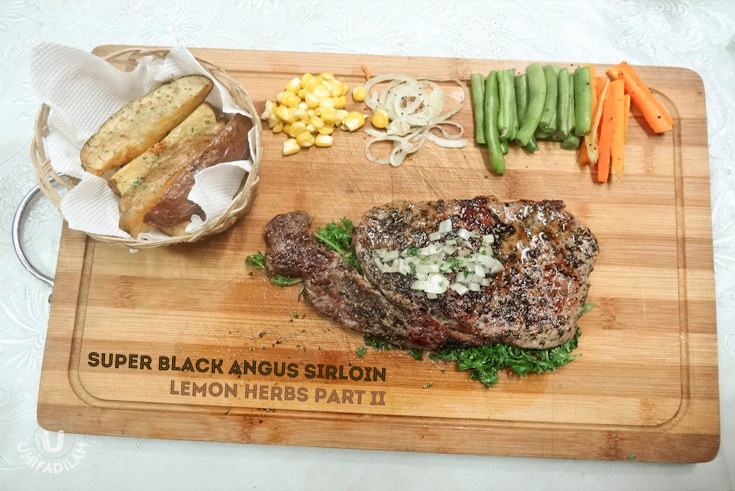 The simplicity of grilled steak with lemon and herbs is just unmatchable. Meticulous! SO WHAT IS IT ABOUT THIS RESTAURANT, REALLY? The vegetables look so-so, not as appetizing & as sweet as Abuba’s. Their wedges cut fries’ portion doesn’t seem fulfilling enough (although it tastes really GOOD). So what is it exactly? I’d say it’s all about the meat. By now you probably have noticed that there is no special dressing sauce to accompany those gorgeous thick cuts of meat. Yes, no BBQ sauce, no white mushroom sauce, none whatsoever. Needless to say, their steak do not need any sauce no more. The high quality ingredients, combined with the right cooking techniques and unique flavor selection is all that is, everything just speaks out for themselves. AND I LIKE MY STEAK JUST LIKE THAT. If you’re the type to avoid much bloated creamy sauce, the ‘overwhelmingly wet’ steak dressing, and are just aiming for simplicity and tastier high quality steak, then you should definitely give SUPER STEAK a try. This is an Australian outback’s steak style, done from a humble home-eatery concept. Opens Tuesday - Sunday. 6PM - 12AM only. Or, find them at Urban Kitchen Senayan City 5th floor.